October 22nd, 2014. 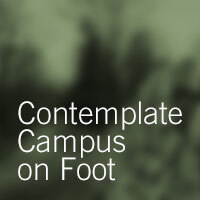 Contemplate Campus on Foot: I’m running a walking workshop at Hart House, University of Toronto, as part of their Slow Down initiative. We’ll begin with a brief introduction to different approaches to walking and contemplation including Chan Buddhist (jingxing​) walking and the notion of the flâneur, and then set out on a stroll to appreciate autumn’s colours.